Cleaning up broken glass after a severe storm or an accident can be a challenging task. Making sure your home or business is secure after a window has been broken is essential to protect the property and people that matter to you. After placing a call to a company that offers commercial and residential glass repair in Houston, taking steps to remove glass fragments from the area and to cover the window can help you reduce the risk of injuries or further damage to your home or business premises. Here are some helpful hints for limiting issues associated with broken glass. If the glass in your window has cracked but not yet broken apart, you may be able to use tape as a temporary measure to secure the window while waiting for your Houston auto glass and window glass company to arrive at your business or home. 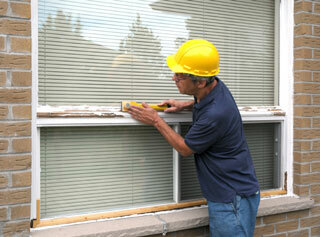 This can often prevent glass from falling out and can provide a safer environment for everyone in the area. Large windows can be covered with sheets of plywood cut to fit the size of the window. These wooden sheets can be secured with screws to the studs surrounding the window. For doors, screws can be used to attach the plywood directly to the door on a temporary basis. Tape can also be applied if screws would cause too much damage to the structure or finish of the door. If plywood is not handy, a large tarp can also be taped into place to prevent rain and wind from entering the damaged portion of the window or door. Always use heavy gloves when picking up pieces of glass. This can prevent cuts and can stop splinters of glass from becoming embedded in soft skin tissue. Sweeping up broken glass is relatively simple on tile, linoleum or hardwood floors. If the broken glass landed on carpeting, however, you may need to vacuum several times to ensure that all fragments of glass have been removed from these floor treatments. At Apple Glass, we are known for our Houston windshield replacement and repair services. Our team of expert glass technicians can also provide you with the residential and commercial glass services you need to keep your home and business secure until windows or doors can be repaired or replaced. 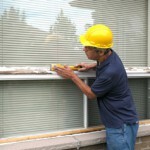 We work with you to determine the most cost-effective and practical solutions for all your glass repair needs. Call us today at 713-680-1400 in the city of Houston and 281-296-0600 in The Woodlands. We look forward to the opportunity to serve you.